Founded in 1895, the Carnegie Museums are a part of Andrew Carnegie's lasting gift to Pittsburgh. The Carnegie Museums complex is located in the Oakland neighborhood of Pittsburgh and encompasses the Carnegie Museum of Art, the Carnegie Museum of Natural History and the Hall of Sculpture and Architecture. Other connected buildings include the Carnegie Free Library and Pittsburgh's own Carnegie Music Hall. The four block, L-shaped complex of beautiful old sandstone buildings is a popular stop for visitors, families, scientists, artists and researchers. Same day admission to both museums provides a wide variety of things to explore, and many sections include hands-on activities where children are encouraged to touch as well as look. The Carnegie Museum of Natural History is one of the six largest natural history museums in the nation, with more than 20 million specimens from all areas of natural history and anthropology. Highlights of the collection include the scientifically accurate, immersive Dinosaurs in Their Time exhibit, an extensive Native American gallery complete with a full-size stuffed buffalo, and the Hillman Hall of Minerals and Gems, one of the foremost collections of gems and minerals in the world. Called the "home of the dinosaurs" for its famed skeletons of Tyrannosaurus rex, Diplodocus carnegie (Dippy), and other extraordinary fossils, the Carnegie Museum of Natural History is the world's third-largest repository of dinosaur fossils. You'll find more publicly displayed dinosaur skeletons here than anywhere else in the world. They're the genuine article, too - actual dinosaur fossils - unlike most museum dinosaurs which are casts constructed out of plastic or metal. Visitors can also witness dinosaur fossils and other prehistoric creatures being prepared for exhibit and study in PaleoLab. The Carnegie Museum of Art brings a splash of modern color and design to Pittsburgh. Established in 1895 from the personal collection of Andrew Carnegie, the museum features distinguished masterpieces of French Impressionist, Post-Impressionist and 19th-Century American art. The large collection of paintings, prints and sculpture by old masters, such as van Gogh, Renoir, Monet and Picasso, shares space with works by contemporary artists in the Scaife Gallery. It's not just paintings either. The Hall of Architecture steps back in time with more than 140 life-size plaster casts of architectural masterpieces and sculptures from around the world. There's also an interesting collection of chairs, including designs by Frank Lloyd Wright. The best thing about the Carnegie is that it makes art interesting. Just one reason why Child Magazine ranked the Carnegie Museum of Art in Pittsburgh at #5 in its March 2006 "10 Best Art Museums for Kids." There are plenty of places to enjoy a relaxing meal in and around the Carnegie museums, including the self-service Museum Cafe on the main floor, open for lunch Tuesday through Saturday. The museum also has a Fossil Fuels snack bar and a Brown Bag Lunchroom where you can bring your own lunch, or get something from the vending machines. The open-air Sculpture Court is a great place to eat your meal outside on nice days. There are also dozens of other places to eat in nearby Oakland restaurants. Hours: Monday, 10:00 a.m. - 5:00 p.m.; Wednesday, 10:00 a.m. - 5:00 p.m.; Thursday, 10:00 a.m. - 8:00 p.m.; Friday & Saturday, 10:00 a.m. - 5:00 p.m.; and Sunday, 12:00 noon - 5:00 p.m. Closed on Tuesdays, plus some holidays (usually Easter, Thanksgiving and Christmas). Please check the website before you visit for updates. Adults $19.95, Seniors (65+) $14.95, Children (3-18) and full-time students with ID $11.95. Children under 3 and members of the Carnegie Museums get in free. Admission after 4:00 p.m. on Thursdays is $10 per adult/senior and $5 per student/child. Admission includes same-day access to both the Carnegie Museum of Natural History and the Carnegie Museum of Art. 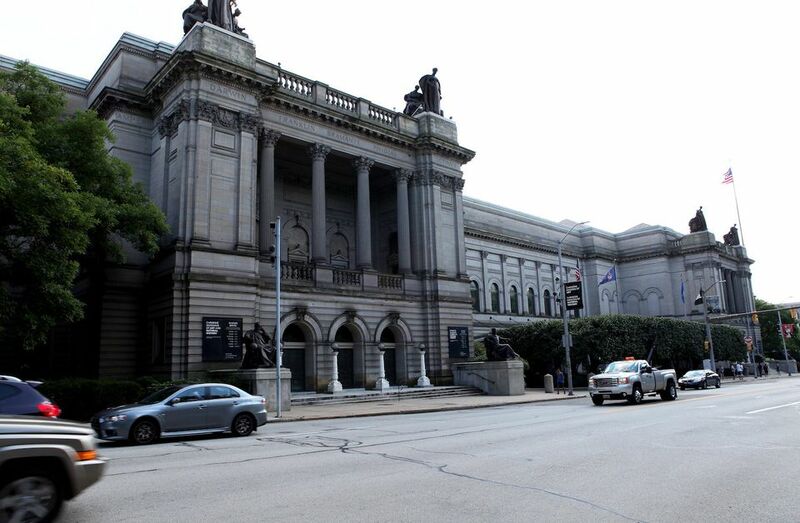 The Carnegie Museums of Art and Natural History are located in Oakland, in the East End of Pittsburgh. Take I-79 S to I-279S, or take Rt. 8S to Rt. 28S to I-279S. Follow I-279S toward downtown Pittsburgh and then I-579 to the Oakland/Monroeville exit. After exiting I-579, follow Boulevard of the Allies to the Forbes Ave. exit ramp. Follow Forbes Ave. about 1.5 miles. The Carnegie Museums will be on your right. * Alternate route (from Etna, Route 28) - take PA Route 28 South to Exit 6 (Highland Park Bridge). Take the left lane over the bridge and follow the exit ramp. Get in the right lane. After 3/10 mile take the right turn onto Washington Boulevard. After about 2 miles, Washington Blvd. crosses Penn Ave. and turns into Fifth Ave. Continue down Fifth Ave. about 2 more miles into Oakland. Turn left onto South Craig St. which dead ends at the museum parking lot. Take either Rt. 22 or the PA Turnpike to Monroeville. From there take I-376 west toward Pittsburgh approximately 13 miles. Exit at Oakland onto Bates St. and follow up the hill and until it ends at the intersection with Bouquet St. Turn left and follow Bouquet to the first traffic light. Make a right onto Forbes Ave. The Carnegie Museum is on the right at the third traffic light. Take I-279 N toward Pittsburgh, to the Fort Pitt Tunnel. If you're coming from the Airport/West, follow Route 60 to I-279 N. Get in the right-hand lane going through the tunnel, and follow the signs for I-376 East to Monroeville. From 376E, take Exit 2A (Oakland) which exits onto Forbes Ave. (one-way) and follow about 1.5 miles to the Carnegie Museum. * Alternate route - take Rt. 51 to the Liberty Tunnels. Take the inbound tunnel and cross the Liberty Bridge in the right-hand lane. Exit onto the Blvd. of the Allies ramp toward I-376E (Oakland/Monroeville). From Blvd. of the Allies, take the Forbes Ave. ramp and follow Forbes Ave. about 1.5 miles to the Carnegie Museum. A six-level parking garage is located behind the museum, with the entrance at the intersection of Forbes Ave. and South Craig St. Upper-deck parking available for larger vehicles (full-size vans, campers, etc.). Parking rates are by the hour during the week, and $5 on evenings and weekends.